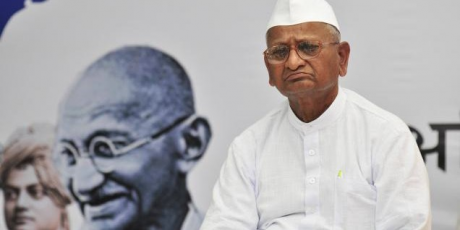 Right now, Anna Hazare, a 73-year-old Gandhian, sits fasting in the burning sun, and he will stay until death— unless the government agrees to consider a powerful law that could rid Indian politics of the scourge of corruption. Hazare is championing a citizen-developed bill called “Jan” Lokpal that will create an independent body, selected by judges, citizens and constitutional authorities, with enough power to investigate and punish all politicians. No minister or bureaucrat will be able to influence its investigations. Since 1968, when this bill was first introduced, greedy politicians have thwarted its passing. Now the government is pushing for a watered down Lokpal with no hope of ending fraud, vice and dishonesty — it gives politicians overriding power to decide who will be investigated, and is a complete sellout. Pressure is mounting on Prime Minister Singh to endorse the “Jan” Lokpal. Members of the opposition party have begun to make the right noises in support of Anna Hazare. And even the National Advisory Council, a powerful advisory body to Sonia Gandhi have come out in favour of the bill. But corrupt politicians and vested interests are doing all they can to kill it. Corruption in politics has become a plague across our country, it is draining our resources and demoralizing our nation. This bill would go a long way to deterring those that steal and undermine the public good. Last year, the Avaaz community in Brazil won an important victory — against the odds millions of people came together and pushed through a historic anti-corruption law. India has a proud history of people power overcoming oppression — today if we all stand with one voice we can fight this corruption that is poisoning our political system. and the whole Avaaz team. Subscribe latest news, events, activities….